P110 Techno-Edge™ high speed wax/resin is a thermal transfer ribbon that is designed especially for online date coders and high speed print and apply applications where optimum printing performance at high speeds is required. 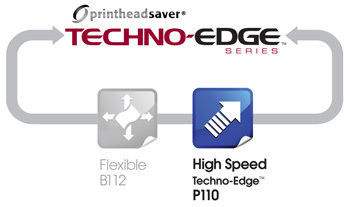 Developed for near edge technology printers, P110 produces excellent print density and definition on a wide range of substrates, producing high resolution bar codes, texts and graphics. P110 has a high resistance to scratching, smearing, abrasion and heat for superior scan rates in high volume applications. CLICK HERE to view the P110 High Speed Techno-Edge™ data sheet.